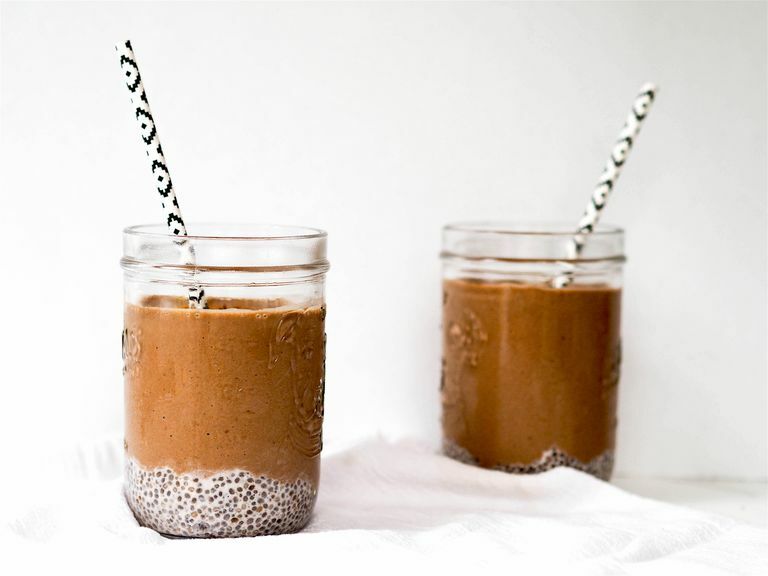 Satisfy a chocolate craving with this rich and creamy chocolate chia smoothie, perfect for breakfast, snack, or even a healthy dessert! Cinnamon flecked chia pudding is layered with a thick peanut butter and a chocolate smoothie that’s naturally sweetened with bananas. Although it feels like a rich and decadent treat, it’s packed with anti-inflammatory ingredients that also help lower blood sugar, like chia seeds, cinnamon, and cocoa powder. In a medium bowl, whisk together almond milk, chia seeds, and cinnamon. Let sit for at least 10 minutes for the chia seeds to swell and absorb the liquid. Combine the banana, almond milk, cocoa powder, and peanut butter powder in a blender. Puree until well combined. Divide the chia pudding between two glasses. Top with the smoothie and serve immediately. Have you ever eaten chia seeds? The small seeds, usually associated with gag gifts from the 80s, are a completely edible and super nutritious food. They’re packed with omega-3 fats, fiber, calcium, and phosphorus. Chia seeds swell to about 10 times their dry size in liquids, so they may help keep you fuller longer. If you’ve never tried chia seeds, the texture is pretty similar to tapioca pudding. If you don’t think you’ll like it, blend the chia seeds, cinnamon, and additional almond milk into the smoothie, which helps give it an extra creamy texture. Chia seeds are widely available, but if you’re having a hard time locating them, check the bulk aisle of the grocery store or order online. Extra chia seeds will last 2 to 3 years stored in a waterproof package, like a glass mason jar. This recipe uses peanut butter powder to keep the fat content down. While there’s some fat in the chia seed if you’d like to make it more satiating, swap the peanut butter powder for an equal amount of regular peanut butter. You could also throw in a handful of oats to add more filling fiber. This smoothie also works great as a post-workout snack because it provides carbohydrate to replenish glucose stores, and potassium to help replace what’s lost in sweat. You may want to add a scoop of chocolate protein powder instead of the cocoa powder to help rebuild muscles post-workout. I always keep frozen bananas on hand for making smoothies or lower sugar desserts. If you have some extra bananas laying around, peel them and store in the freezer before they go bad. I like to keep them cut into halves in a plastic bag for easy use. Use a banana that’s extra ripe to make sure this recipe is sweet enough. To save time in the morning, make a big batch of chia pudding in the beginning of the week and store in the refrigerator until you’re ready to enjoy your smoothie. The chia pudding should keep at least 5 days. To give your smoothie a more ice cream like consistency, use less liquid, and prepare it in a food processor instead of a blender. Try ½ to start and then add more almond milk as needed. If you prefer it thinner, add more almond milk until it forms your desired consistency.